Examine, build, create and learn! This First Drum of Bricks comprises many different shapes and colors to inspire young ones to shape their own playtime. 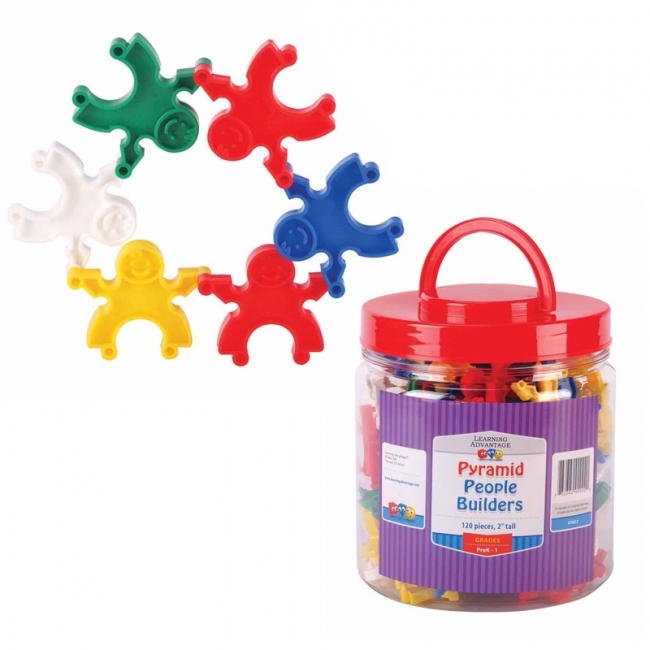 Helps to develop dexterity and co-ordination. Made from high quality, responsibly sourced materials. Conforms to current U.S. safety standards. Age 1+ years. Consists of 50 play pieces. 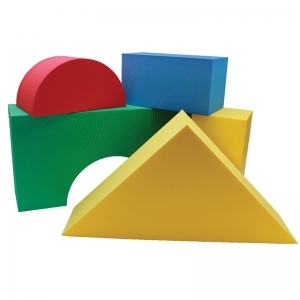 Colorful shapes of super high density foam have precise edges to make building and stacking easy. A wide variety of shapes and sizes fit easily into the durable plastic storage bag with convenient carrying handle. 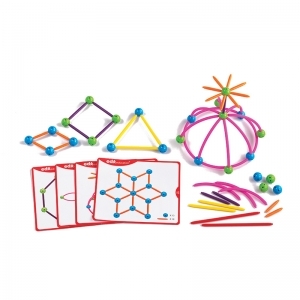 Improve fine motor skills and develop creative thinking skills with this Junior GeoStix construction set. 10 different lengths including quarter and half-circle pieces that snap together at different points. The set includes 200 flexible plastic sticks, and 30 double-sided activity cards. Sizes range from 2.5cm to 15cm and 90° R7.07cm and 180° R7.07cm pieces. Inspire imagination and creativity while developing fine motor, creative thinking and problem solving skills. An ideal hands-on manipulative for children from 3 to 99! 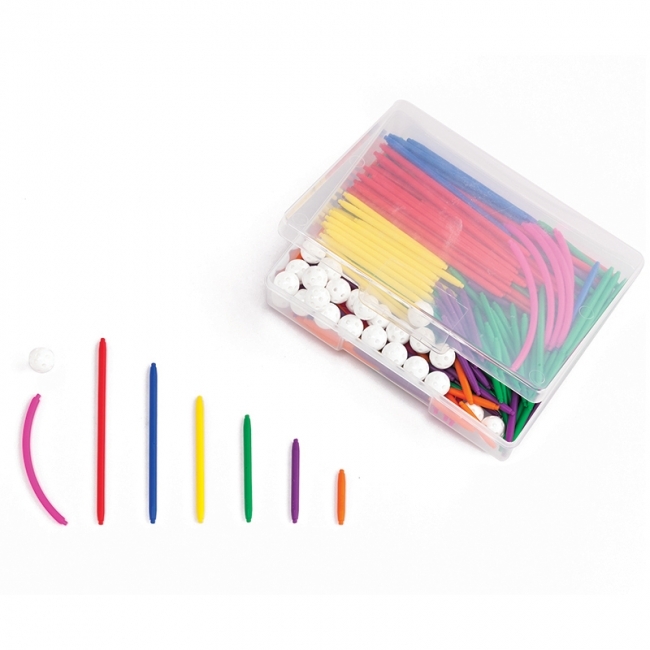 Contents include 200 flexible GeoStix in 10 sizes including quarter and half-circle pieces, 30 double-sided activity cards, instruction manual. Skeletal Starter Geo Set doubles as an introductory math manipulative for hands-on discovery of 2D and 3D geometry principles. 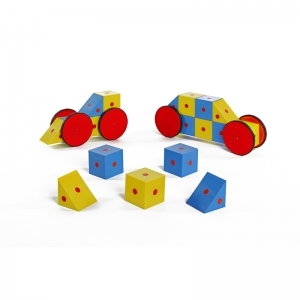 Construction set which will improve children's fine motor skills, as well as develop their creative and problem solving skills. Build two and three dimensional structures. Introduces children to basic geometric shapes. 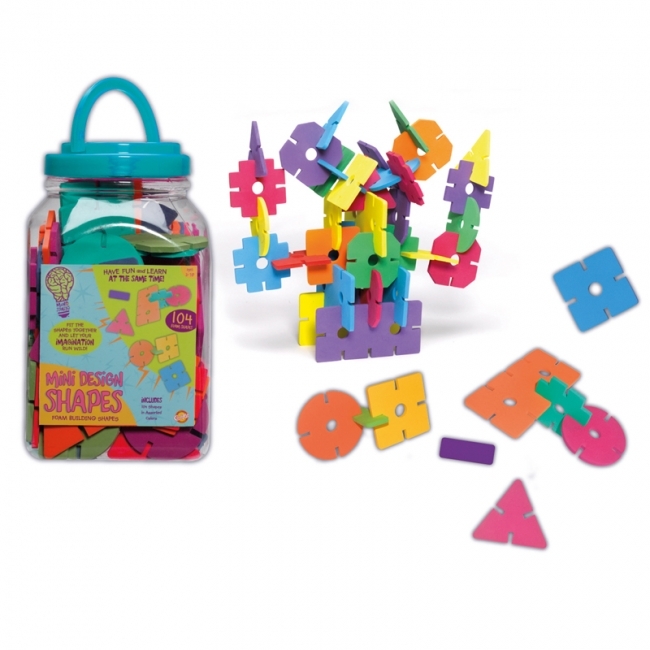 Model 2D shapes, 3D structures and inspire imaginative design with 20 double-sided activity cards. Set includes 80 sticks in 4 sizes and 4 colors, 40 connecting balls in two colors, 24 quarter circles, and 20 x 2-sided full-color activity cards in sturdy plastic container. Skeletal Geo Set is a great math manipulative for hands-on discovery of 2D and 3D geometry principles. Make your own 2D figures and skeletal 3D models. Learn about vertices, faces and edges while involved in constructing new models. 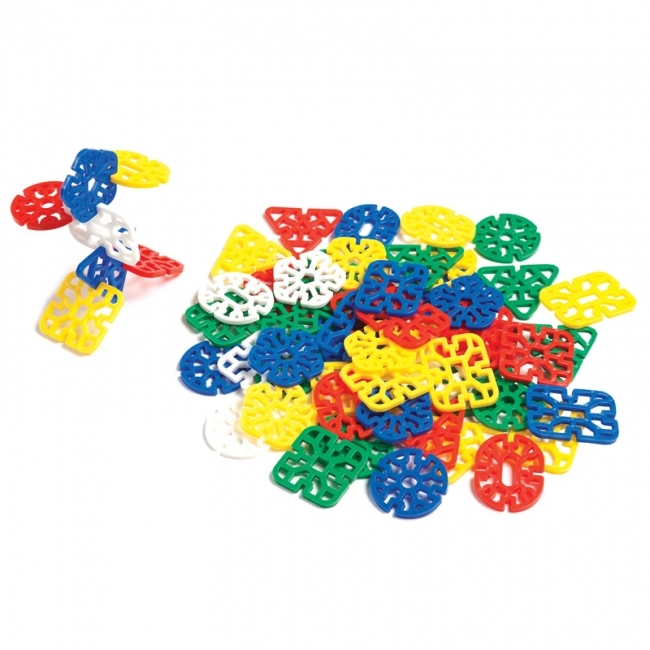 Quarter curve pieces enable students to build and investigate properties of circles and cylinders. Contents include 330 pieces: 60 white balls, sticks of 50 each of 1.29", 2.08", 2.72", 30 each of 3.32", 4.13", 4.92" and 30 quarter circles with 20 double-sided activity cards. 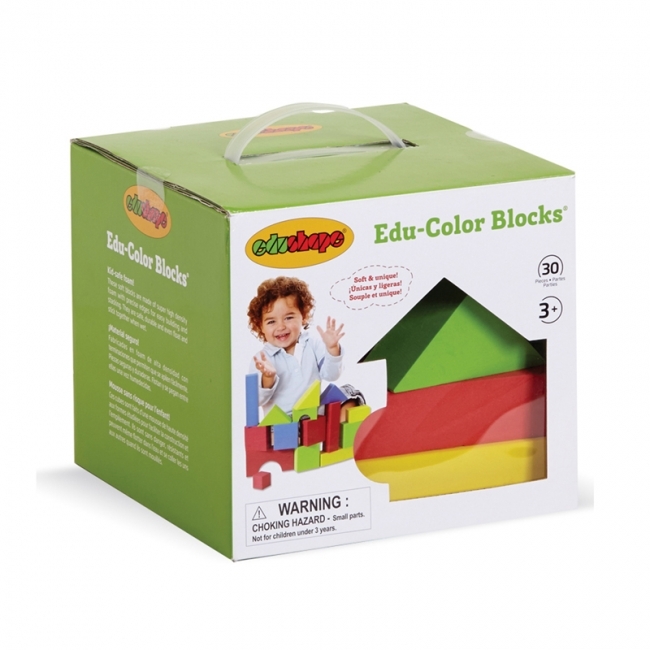 Enhance fine motor skills with Waffle Blocks! 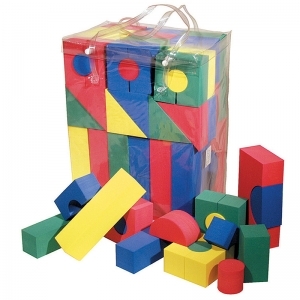 Plastic blocks are uniquely slotted allowing construction in any direction, for unlimited creative construction. 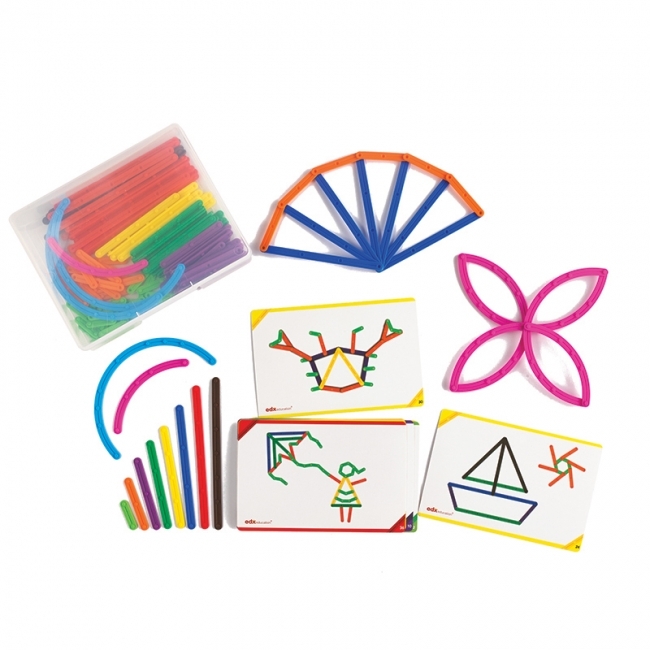 Five bright colors allow for grouping, counting and sorting activities too! 145 (5cm) Waffle Blocks in a handy storage bucket. 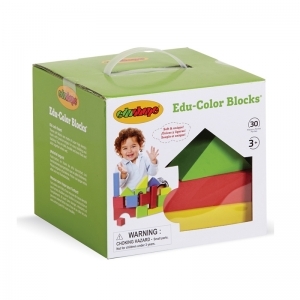 Build hand-eye coordination and color recognition skills with these brightly colored blocks. 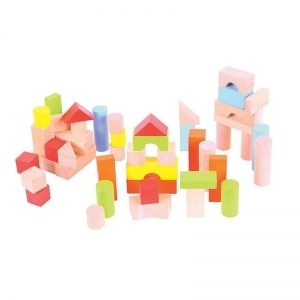 Set includes people-shaped blocks that are easy for small hands to grasp and build unlimited structures. 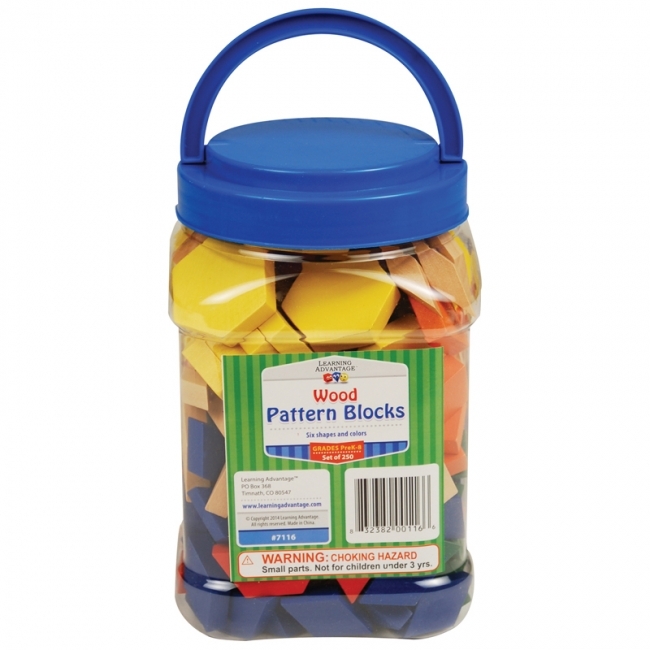 Great for sorting and counting too! Set of 120. 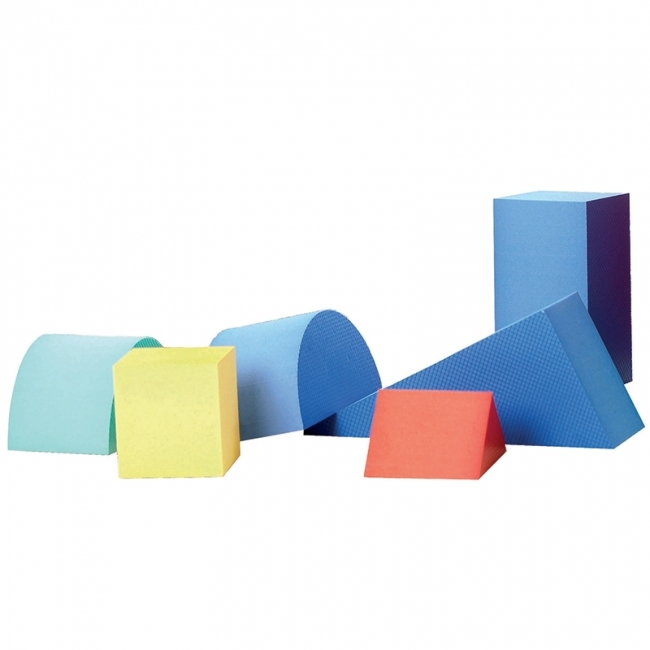 Children will explore patterns, symmetry, linear and area measurement, fractions and problem solving with these colorful blocks. These colorful pattern blocks are crafted with no sharp edges or corners and can be used for multiple learning experiences providing hours of imaginative play. Set of 250 include 25 yellow hexagons, 25 orange squares, 50 green triangles, 50 red trapezoids, 50 blue parallelograms and 50 tan rhombuses packaged in a plastic jar with lid. Lid has built in handle. 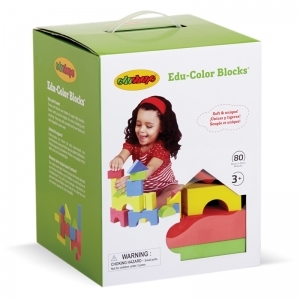 Soft Colorful foam building block are perfect for the young creative builder. 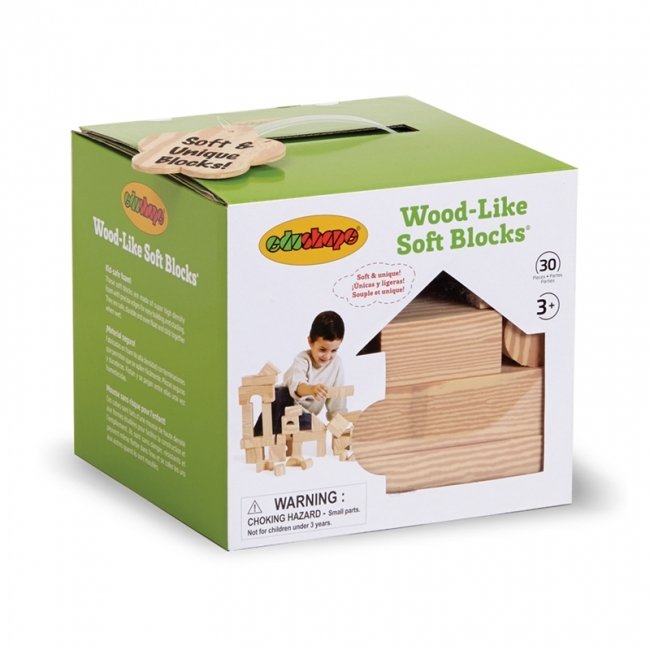 Ideal for block play on the floor or in the bathtub as the blocks float and stick easily to bathtub tile walls when wet. 1 3/8" (3.5 cm) Thick. Set of 80 blocks. WARNING: Choking hazard. Small parts. Not for children under 3 years. You'll think it's wood until you pick it up! 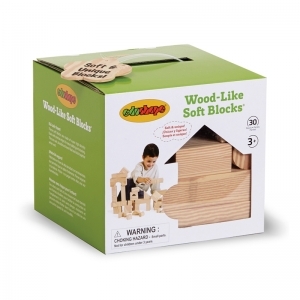 No splinters, firm but not heavy and no sharp wooden corners to worry about. (i.e. 2 squares =1 rectangle). Package dimensions: 7 3/4" x 7 3/4" x 7", 20x20x18 cm. 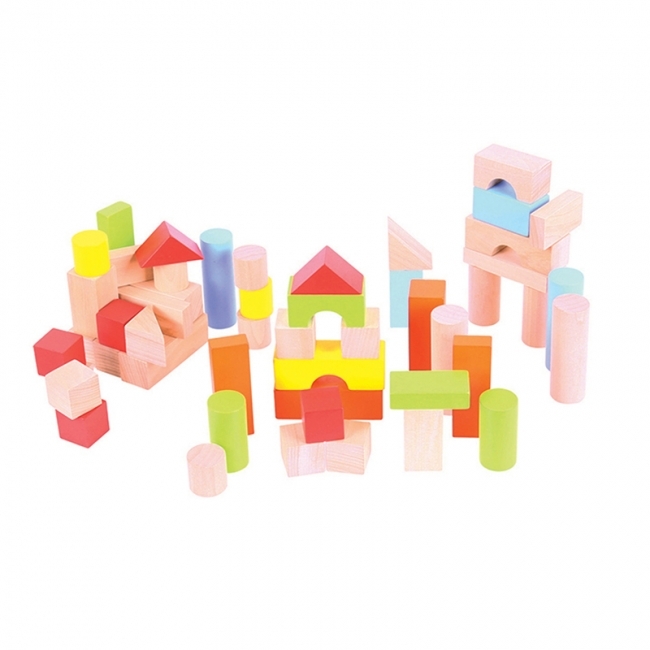 Set Includes: 30 block pieces, 1 3/8" (3.5 cm) thick, assorted unit block shapes and sizes. WARNING: Choking hazard. Small parts. Not for children under 3 years.